Recognized by UNESCO as part of the world’s "intangible cultural heritage," traditional Japanese performing arts like Kabuki and Noh have recently been at the center of something of a boom, following a spate of popular manga titles set in the world of the classical theater. 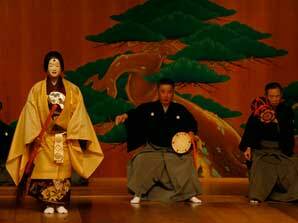 Young people tend to think of Kabuki and Noh as somewhat impenetrable and inaccessible. Attempts to use manga to introduce young people to the traditional performing arts are nothing new—but the comics at the heart of the current boom are quite different from anything that has come before. In the latest manga, readers are drawn in to the story by the adventures of young protagonists of roughly their own age and background, and learn about the world of the traditional theater almost as a side effect. The manga succeed in bringing the classical arts vividly to life, presenting them through the eyes of young people immersed in the tradition and underlining the enduring relevance of Kabuki and Noh as living, breathing art forms. Shaking Up the World of Tradition Kabuki emerged as an art form for the masses in the early years of the Edo Period (1603–1868). The origin of the word comes from the verb kabuku, which referred to behavior that was considered outrageous by the standards of mainstream society. Kabukumon (The Deviant) (original work by David Miyahara, manga version by Tanaka Akio) tells the story of Ichisaka Shinkuro, a young man who delights in shocking people and mounts a full-frontal assault on the staid and hidebound world of Kabuki. 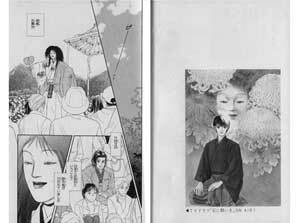 At the beginning of the manga, Shinkuro is stubbornly persevering with street kabuki. He is extremely critical of modern kabuki as it is performed in the expensive theaters with their proud traditions and prestige. Kabuki was originally an art for the masses, and as far as Shinkuro is concerned, that is where it still belongs today. Shinkuro shakes the traditional world of Kabuki to its foundations and thrills audiences with his bold new brand of theater. With audiences on his side, Shinkuro becomes more daring and radical than ever. But there is more than simple shock value to his performances—they are imbued with the same primitive power that made the original Kabuki so attractive to begin with. The Kabuki theater is a closed world of heritage and tradition, dominated by many of the same families and teacher-pupil relationships since the Edo Period. Shockingly for an upstart actor from an undistinguished background, Shinkuro behaves toward the scions of these ancient families and their star actors as if he is their equal, bringing gusts of fresh air into the staid world of tradition. The plays performed in the course of the action-packed story are described in detail, drawing the reader irresistibly into the world of the classics. 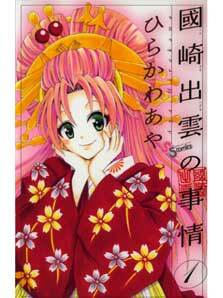 Kunisaki Izumo no Jijo (The Circumstances of Kunisaki Izumo, by Hirakawa Aya) is a love comedy. 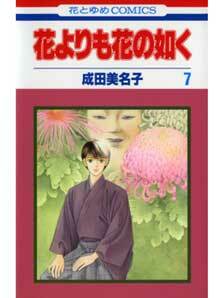 The main character is Kunisaki Izumo, a handsome young man born into a family of Kabuki actors. In Kabuki, all female roles are played by specialist male actors called onnagata. 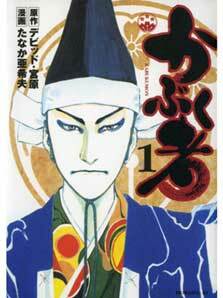 The story deals with the adventures of Izumo as he takes the first steps toward a glistening career as an onnagata. Again, the story deals with many of the best-known plays of the Kabuki tradition, and the reader is drawn inexorably into the beautiful world of the classical theater.